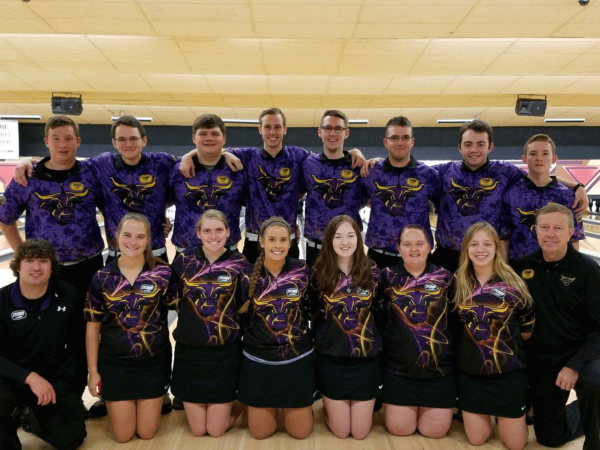 My favorite part about college bowling is being part of a team that cares about the sport of bowling as much as I do and being able to compete at such a high level of competition. Another part I love is seeing all of my friends that I have made from other teams across the country. My preparation before a tournament is getting my physical game the way that I feel is good and getting my arsenal ready with the right surfaces and the right ball selections. Our team practices Monday-Thursday from 4:30-6:00pm. We also have 1 on 1 times with the coaches to work on specific aspects. Teamwork means working together and pushing each other to be the best they can be, both on and off the lanes. Everybody sees the lanes differently, communication about the lanes and ball choice are essential pieces to perform well at tournaments and it is a way for the younger players to learn about lane play and transitions. Having someone that keeps up the energy is also important because it keeps everyone more active and involved throughout the entire tournament. Both aspects are very important but I believe that the mental game is more important. The mental game helps you bounce back from a bad game and help you focus on what you should be doing on the next pair. It also takes longer to develop and understand than the physical game, especially if your team needs to be on the same page. How does Storm and their products help you and your team? We are very blessed as a small program to be sponsored by the Storm and Roto Grip Companies and to that we say thank you very much! They have given us the best bowling ball options that are available on the current market and new equipment to replace all our old stuff, that are great for moving from pair to pair at tournaments. My life as a collegiate athlete is great, I get to practice everyday with some of my best friends and study about my favorite topics that we discuss in class. We usually start by spreading out and throwing balls to get warmed up. After we are warmed up, we split into 2 groups and shoot at 10 10 pins and 10 7 pins. As a team each group has to make 10 consecutive 10 pins or 7 pins without missing, if someone misses, that group has to start over. The first group to 10 forces the other group to do 25 reps of something, whether it’s push-ups, sit-ups or lunges etc. After we finish both 10’s and 7’s, we tend to do baker tournaments, can be 2, 3, 4 or 5 players. We do not have mandatory workouts, I keep in shape by working out at the campus gym. I’ll run around the track, play pick up basketball or lift weights. Outside of practice, I bowl on Tuesday night league. The practice facility is on campus, otherwise there are 2 other bowling alleys within 10 minutes of the school. The men’s and women’s teams practice together everyday. The 1 on 1 times are also scheduled between the men and women. My favorite Storm bowling ball has to be the IQ Tour Solid. I love the benchmark motion that it has and I can use it on any pattern. I have owned 4 of these and I’ll order another one this semester to replace my oldest one. I pick my arsenal around my IQ Tour, since I use that ball every tournament. I have a urethane for my spare ball. The other 3 or 4, I’ll usually have a strong ball that can roll early in the mid-lane. Next, I’ll have a pearl for when the pattern gets burnt up and we need to start lofting. My last ball is a Roto Grip Show Off, it’s a lower end ball, which is good for when my IQ Tour starts to lose its’ surface and I need a little more backend. The other option is another IQ Tour but it has a different drilling. It all depends on what kind of tournament we go to, either a tier 1 or tier 2. I can say that it is so much to have side competition between all my friends. It’s amazing the people that I have met through college bowling and that is why I love going to tournaments. Yes, it is possible to have a job. Employers are very flexible with students and are willing to work with you if you work with them. We have jobs on campus with very flexible hours and days. What’s the funniest thing that has happened in college bowling? 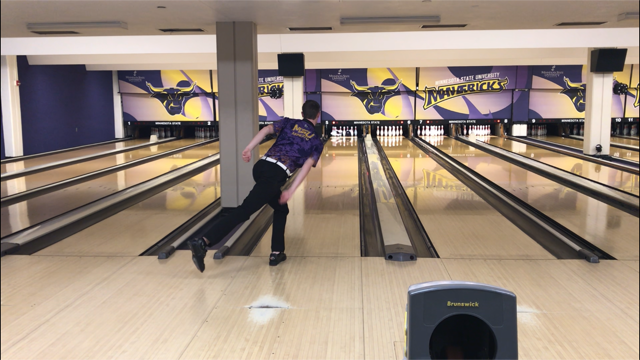 The funniest thing was last year at club nationals, my teammate was doing his final shot of college bowling and he decided to loft it. The first time he guttered but the second time, the ball slipped out of his hand and bounced off the gutter cap of his lane and landed on the lane to the right of him. It straightened out once it landed and struck the other lane! Everybody on our pair laughed and all the pairs next to us laughed and gave him high-fives. 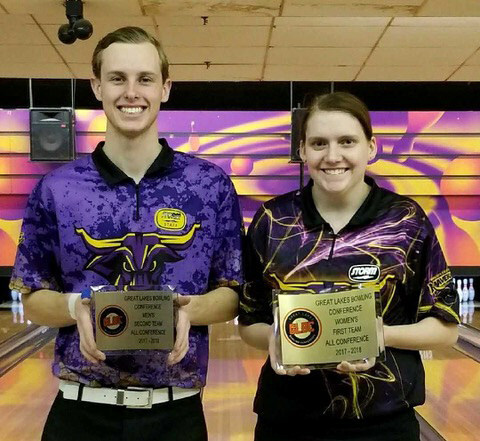 College bowling is much more intense than high school. There are hundreds more players and many more teams at every tournament than the high school meets. It can be very intimidating but your teammates and coach will help you feel just as comfortable as you did in high school, while learning about the atmosphere at the same time.